The South African economy grew by the slowest rate in 2016, since the 2009 recession when economic growth contracted, barely missing another recession. Growth was well below government expectations and therefore has a significant impact on expected revenue collection and expenditure plans. Business confidence remained weak in the 1st quarter of 2017 as political turmoil and instability weigh heavily on the South African economy and business sentiment. At the current rate, investment levels will remain poor, contributing to constraints in South Africa’s economic growth as well as investment in construction. All economic indicators currently suggest that investment in relation to GDP is likely to slow over the medium term, due to slower government spending, financial constraints experienced by SOE’s and continued weak private sector confidence. He states that service delivery, especially at municipal level remains a critical burning issue. The consulting engineering industry is threatened by incapacitated local and provincial governments. As major clients to the industry, it is important that these institutions become more effective, more proactive in identifying needs and priorities and more efficient in project implementation and management. 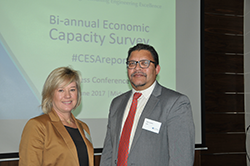 “On a positive note with the transformation of the industry high on CESA’s agenda we are pleased that the appointment of Black executive staff has steadily increased showing real significant progress in terms of industry transformation”, says Campbell. The appointment of Black executive staff (including Black, Asian and Coloured staff), measured by the contribution of Black executive directors, non-executive directors, members and partners as a percentage of total executive staff, increased to 45.7 percent from 40.8 percent and 39.5 percentin the previous two surveys. The appointment of Black executive staff has steadily increased from 28.1 percent in the June 2012 survey. This shows real significant progress in terms of industry transformation. Confidence levels amongst firms has deteriorated over the last few years, alongside modest increases in fee earnings. Since the December 2015 survey when confidence levels fell to its lowest level in 16 years there has been some improvement with the net satisfaction rate improving to 87.5 percent in the last six months of 2016, from 75.0 percent in the June 2016 survey. It remains to be seen whether the recovery in confidence levels will filter through to stronger growth in earnings, considering the more moderate outlook on profitability as well as the drop in the orderbook to income ratios in the current survey. Gross fixed capital formation (GFCF) fell by 3.9 percent in 2016, the first contraction since 2009 and 2010. Investment was negatively affected by a slowdown in government investment from an increase of 13.4 percent in 2015 to 1.1 percent in 2016, further contraction in SOE’s expenditure and a sharp decline in private sector investment which fell by 6 percent in 2016. GFCF as a percentage of GDP averaged at 20.0 percent in 2016, slowing to 19.9 percent in the 4th quarter of 2016, from an average of 20.9 percent in 2015. The National Development Plan’s (NDP) target of 30 percent contribution of GFCF to GDP by 2030 seems unachievable at this rate. Fee earnings in the last six months of 2016 rose marginally by 1 percent compared to the first six months of 2016, which was relatively unchanged compared to the same period in 2015. The increase was lower than the expected 6 percent increase reported in the previous survey. Respondents expect earnings to fall by 7 percent in the first six months of 2017 compared with the last six months of 2016. Payment remains a serious issue, having a broad-based effect on firms operating in the industry. It is estimated that around R6.0bn in earnings is currently outstanding after the 90-day period. After having shown some improvement in the December 2015 survey, the percentage of fees outstanding for longer than 90 days as a percentage of total estimated income deteriorated to an average of 25 percent in the first six months of 2016, the highest recorded level since 1999, but has shown some moderation to an average of 23.1 percent in the December 2016 survey. Regulation issues, including the procurement of consulting engineering services, remains one of the biggest challenges faced by the industry. Unrealistic tendering fees remain a concern for members, while the extended time it takes in which to finalize a proposal is affecting profitability in the industry. Unlocking greater private sector participation is seen as a critical element to fast track delivery which will support engineering fees and as such engineering development in the industry. Government must create an environment for the private sector so that it can play a much bigger role in infrastructure delivery. Many of the projects highlighted in the NDP can be carried out by the private sector through public-private partnerships. Lack of attention to maintain infrastructure poses a serious problem for the industry. Not only is it more costly to build new infrastructure, but dilapidated infrastructure hampers economic growth potential. In many cases, infrastructure is left to deteriorate to such a state, that maintenance becomes almost impossible. All CESA member firms are required to have a QMS as a condition of CESA membership. The majority of firms reported to have a QMS system in place (96 percent). While all the larger, medium and smaller size firms reported to have the QMS in place, only 85% of the micro enterprises that responded to the survey currently comply, down from 93 percent in the previous survey.